We’ve encountered Game Events (and Move Events) before – Battle Events are another type of events. They may lack some of the event steps available in game events, but in contrast offer their own event steps specifically for battle. While you have to add Actors to game events yourself, battle events have them added automatically – the user of the action, and the targets. Also Waypoints are added automatically in battle events – the user base, target base and battle center. One of the most crucial battle event steps is the Calculate step – this step is used to calculate the outcome of an action (e.g. the damage of an attack, the healed amount of HP or the escape chance). You can also use this step multiple times to do multiple damages in a single action. You can learn about doing damage in this how-to. Items and abilities can have multiple battle events – they’ll be performed in sequence and can optionally perform only in selected battle system types. We will split the things we want our battle events to do in multiple smaller events to make them reusable and modular. Open the ORK Framework editor and navigate to Events. Let’s get started! Click on New Battle Event to create a new battle event. This first battle event is quite simple – we will move the user to the target. These settings define which object will change position. This will move an actor of the event. These settings define the target position of the object. We want to move to the position of another object. These settings define if and how the object will move. If this settings aren’t used, the object will be set to the target position immediately. Since we’ve defined the radius for all of our combatants, we don’t need to add a stop distance. If the target object changes it’s position while we move, the new position will be used as target. That’s it for this event – click on Save Event and save it as runToTarget in Assets/Events/Battle/. This event is very similar to the first event, so let’s just edit the already opened event and save it as a new event. Change the following settings. This will make all combatants currently not in action look at their enemies. We’ll change the target position to the user’s base. We’re running back to our base position, so we don’t need to stop earlier. That’s it for this event – click on Save Event As … and save it as runToBase in Assets/Events/Battle/. Now things will get a little bit more complex. We’ll play the attack animation, calculate the damage and, if the attack hit the target, spawn some sparks and play a damage audio. Click on New Battle Event to create a new, blank event. We’ll need two prefabs for our spark effects (which effect is used will be decided randomly). All spawned prefabs will be destroyed at the end of the event. Click on Add Prefab again. We want to spawn the prefab and calculate the damage somewhere in the middle of the the animation. Remember – when playing animations, you always play an animation type. The combatant will play the current animation bound to this type. Now we wait for a second, that should have us somewhere in the middle of the animation. This will calculate if the attack hits and how much damage it will make. The target will play the appropriate animation type (e.g damage or evade). This will allow us to react on the outcome of the attack. The Next slot will be called when the attack hit the target, the Miss slot if the attack missed. This step is connected to the calculate step’s Next slot. We will play a sound type – they work similar to animation types and bind a audio file to a type in the combatant’s settings. Now it’s time to randomly spawn a prefab – for this we’ll create two paths. Click on Add Step once to create a 2nd path. Let’s spawn the prefab on the target. Wait for a short time before we stop emitting particles (it’s only a quick spark). Stop emitting the particles of the prefab. If we would destroy the prefab right away, it’ll generate an ugly cut. Copy the already added spawn prefab step and connect this one to the 2nd slot of the random step. Change the following settings. Also, copy the already added emit particles step and connect it to the 2nd path’s wait. Change the following settings. Connect the calculate step’s Miss slot and both emit particles steps to this wait step. This is our final wait before the event ends and the spawned prefabs are destroyed. That’s it for this event – click on Save Event and save it as attack in Assets/Events/Battle/. Now it’s time to add the events to our Attack ability. Navigate to Status > Abilities and select the Attack ability. Change the following settings. This ability’s animation consists of three battle events. Change the already added battle event settings. The chance decides if the battle event will be performed. You can use this setting to bring some randomness into your animations. Click on Add Animation to add the last event. That’s it for this ability. Repeat the same settings in the Mug Attack ability. Don’t forget about the sound! We’ve added a play audio step to our attack event and used Sound Types. Let’s look into that! Sound types, like animation types, bind audio files to a type – but this binding is defined per combatant. When playing a sound type on a combatant, he will play his audio file assigned to this type. This way we can share events across combatants, but always play individual sounds. We don’t need other sound types for now, so let’s set up the damage sound on our combatants (the one we used in our event). Navigate to Combatants > Combatants and change the following settings on all combatants. Click on Add Sound to add a sound type binding. Can be found in Assets/Tutorial Assets/Audio/. Open the main menu scene (0 Main Menu) and hit Play. Walk outside of the town and into the battle. 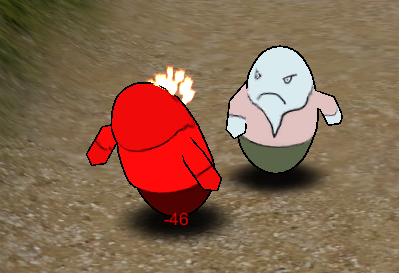 You will notice that the player and enemy now use the attack animations we just defined – cool! 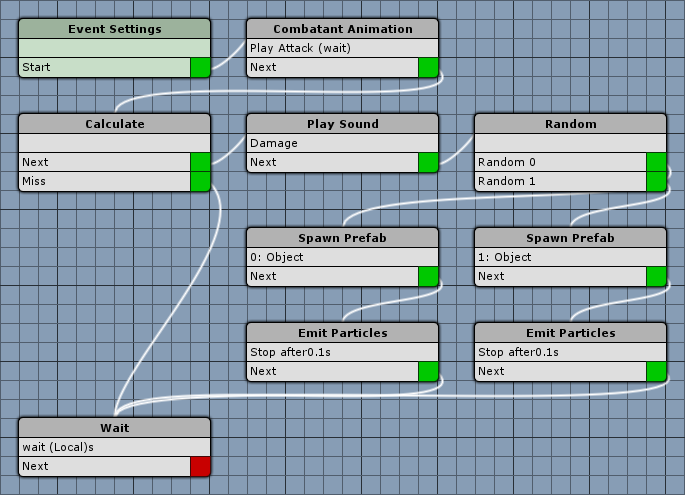 Combatants moving around, particle effects and sound … we’re on the right track, but still a lot of battle events to do. And that’s it for now – the next lesson will continue with animating the battle.